1: Morecambe FC were founded in 1920, initially playing in the Lancashire Combination. They moved into Christie Park a year later, with the ground getting its name in 1928 thanks to the club president who acquired the land on which the ground is built. 2: The club remained in the Lancashire Combination right up until 1968. Mixed fortunes were had over the years but they rose to be Champions of the league on 5 separate occasions. 3: In 1968 Morecambe FC became founder members of the Northern Premier League. They remained in its top division when the league expanded in 1987. Despite an excellent finish of 3rd in their first year, it would take until 1995 until they would progress further. That season they finished 2nd, 4 points behind champions Marine. However due to issues with the Merseysiders' ground, Morecambe took their promotion spot. 4: From 1995 until 2007, Morecambe were unbroken members of the Conference, only finishing below halfway in 2 of those seasons. Their final seasons saw them finish 3rd, to earn a spot in the end of season playoffs. The defeated York City over 2 legs in the semis, before beating Exeter City at Wembley in the final. 5: Since 2007, the club has been in the football league. They have never progressed below its bottom tier with their best finish coming in 2010, their last at Christie Park when they finished 4th. Despite giving the ground a great sendoff with a 2-1 win in the 2nd leg of the semis, the damage had already been done down in London where Dagenham & Redbridge won 6-0. 6: Morecambe's best ever run in the FA Cup came in the 2000/01 season when they reached the 3rd Round. That season they beat Cambridge United on the way to losing 3-0 at home to Ipswich Town. 7: Morecambe's debut season in the League Cup saw fine victories over Preston North End and Wolves before a crushing 5-0 defeat to Sheffield United in the 2007/08 third round. 8: The club lifted the FA Trophy in 1974 when they beat Dartford 2-1 at Wembley Stadium. In 2002 they got to the competition's semi-final before losing to Stevenage Borough 4-1 over 2 legs. 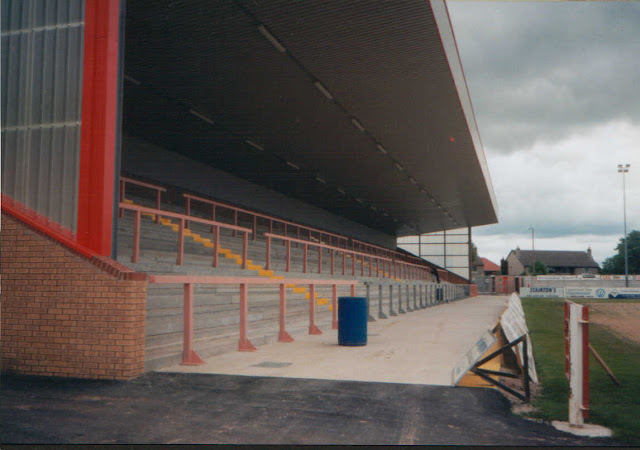 9: During 2005, Carlisle United were based at Christie Park for 6 weeks. This was due to flooding at their Brunton Park home, sadly a regular inconvenience for them. 10: The final game played at Christie Park was Morecambe's 2-1 victory over Dagenham & Redbridge in the League 2 playoffs. The match took place on Thursday 20th March 2010. Since demolition, a Sainsbury's superstore has been built in its place. Along with a weekend in Blackpool I was planning to go to the previous day’s match between Fleetwood Town & Prescot Cables. But a combination of horrendous traffic around the Stoke area of the M6 and the fact that I was forced to work till 10am meant I didn’t get to my destination in time and missed it. I made the best of what I had though and had a few drinks in Blackpool in the evening. On the way to the game I went to Blackpool Mechanics, Squires Gate and Fleetwood Town before a quick look around the town of Morecambe. This was Wycombe’s first visit in the league to Morecambe's former home, Christie Park, but we did play an FA Trophy match on our way to doing the double in 1993. The result on that occasion was 1-1, Wycombe winning the replay 2-0. Of course both sides fortunes and circumstances have changed since then with Morecambe following Wanderers into the League last year, 14 years later than the last match between the two sides. Wycombe had already beaten the Shrimps 2-0 this season, the game after the Stockport debacle. And it was 2 victories out of 2 as Wycombe won 1-0 with a great goal from Stefan Oakes. After a slightly scrappy start, Wycombe pulled themselves together and took control of the game. Several chances has come and gone before on 36 minutes Chris Herd was fouled 30 yards from goal. Stefan Oakes sent the resulting free kick flying into the top corner to send the visiting supporters into raptures. Well almost all of them. A highly depressed Johnny P was seen with his head in his hands at half time as the combination of the presence of some Celtic fans and his least favourite player scoring made him probably the only Wycombe fan to go home unhappy on that day! Morecambe tried in vain to get back into the game in the second half. There were a few hairy moments, but overall Wycombe looked the most likely to get the next goal. A valuable victory then, which left Wycombe with a bit of breathing space between them and the 8th placed team, just outside the play-offs. 11 months after my initial visit I was back for my second and what turned out to be final trip to Christie Park. There were no takers in my car this time so I went up on the supporters coach, having a few pints in the excellent York Hotel and buying a little Morecambe FC pennant before the game to add to my collection. That was where the enjoyment stopped, for on the pitch the game was as dull as ditchwater and one of the worst games I have ever seen. At least we didn't lose and made it 2 clean sheets out of 2 from my visits to Chrsitie Park, but this game will not live long in the memory. 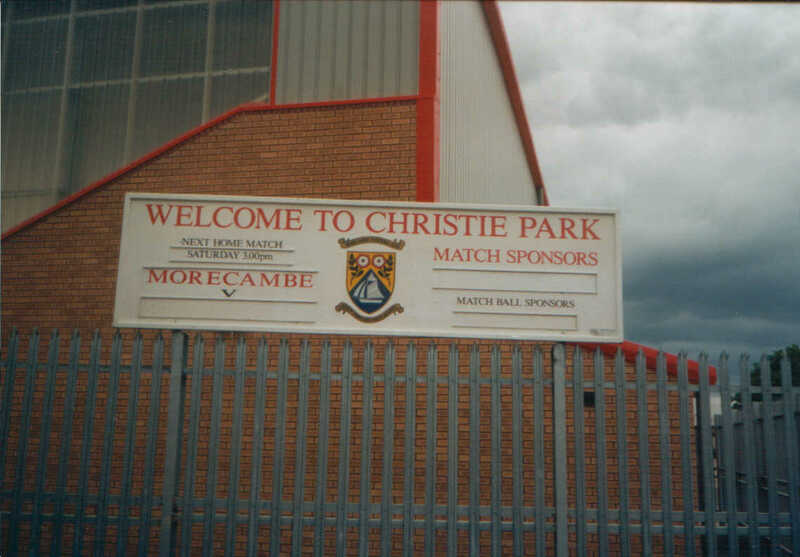 Morecambe's former home CHRISTIE PARK is not too different to their current home in terms of capacity and facilities. A decent sized, but ageing Main Stand had capacity for around 1500 fans. Opposite was a basic uncovered terrace, named the Car Wash side. Both ends were covered terraces, the home one being one of the larger terraces I've seen, whilst the away fans one being smaller, but still with room for around a thousand fans. There wasn't a massive amount near the ground but there was a decent pub called The York Hotel which had plenty of football memorabilia on its walls. I actually visited the ground in the mid 90's, just for photos, and it was impressive for the NPL then, and it was still a fairly good ground in football league terms.